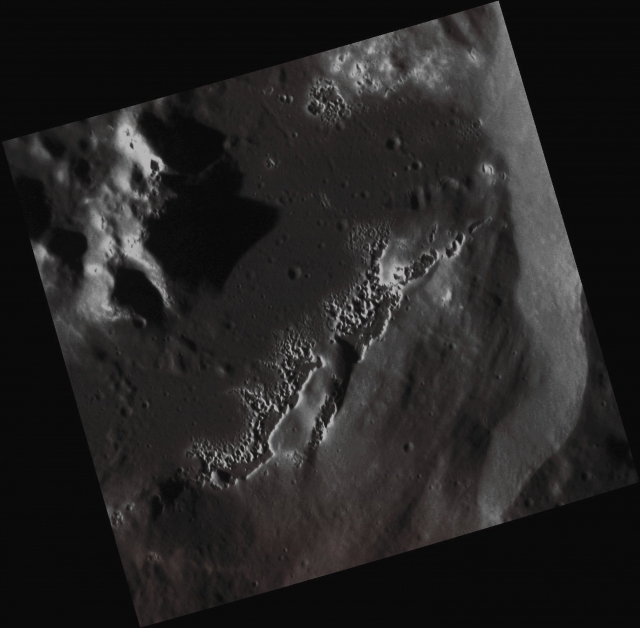 As you should already know, Hollows, on Mercury, are often associated with Pyroclastic Deposits. This Geophysical Association is well illustrated here, in this view (approx. 33 Km - such as about 20,493 miles - across) of the Floor of Mistral Crater. The huge, Irregular Depressions visible here (in the upper left - Sx - quadrant of the picture) are Volcanic Vents from which Explosive Eruptions ejected large amounts of Pyroclastic Material. On the other hand, the small, Clustered Depressions with Bright Halos, are the - now famous - Hollows. This picture (which is an Original NASA - MESSENGER Spacecraft's b/w and Map-Projected image published on the NASA - Planetary Photojournal with the ID n. PIA 18946) has been additionally processed, contrast enhanced, Gamma corrected, magnified to aid the visibility of the details and then colorized in Absolute Natural Colors (such as the colors that a human eye would actually perceive if someone were onboard the NASA - MESSENGER Spacecraft and then looked outside, towards the Surface of Mercury), by using an original technique created - and, in time, dramatically improved - by the Lunar Explorer Italia Team. Different colors, as well as different shades of the same color, mean, among other things, the existence of different Elements (Minerals) present on the Surface of Mercury, each having a different Albedo (---> Reflectivity) and Chemical Composition.